Preheat oven to 375. Thinly slice the orange and fennel. 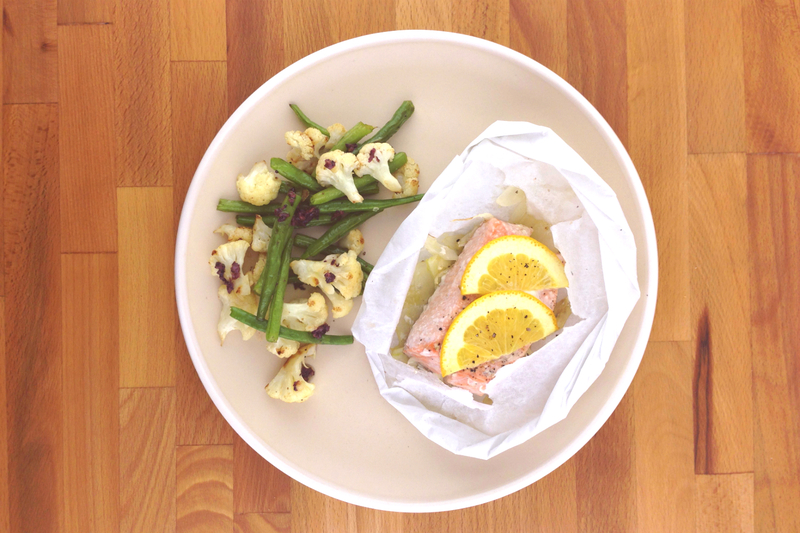 Get ready to prepare the packets by folding each piece of parchment in half to make a crease. Open each sheet of paper and lay them out with other ingredients, creating a “workstation” for yourself. Evenly divide ingredients, layering on one side of the crease in each parchment sheet in the following order: sliced fennel, topped with a drizzle of olive oil and a sprinkle of salt & pepper; trout topped with another sprinkle of salt & pepper; and finally, slices of orange to finish. Fold other half of parchment over ingredients. Starting at one end of the fold, make overlapping creases around the open edge, crimping parchment to seal in steam (see notes). Place on baking sheet, bake for 18 minutes. Meanwhile, trim stem end of green beans if needed. Heat a small amount of oil in a skillet over med-high heat. Add cauliflower and sauté 2 minutes. Add green beans and 2-3 tablespoons of water. Cover and steam 3-4 minutes. Remove lid and continue to sauté until water has evaporated, and vegetables are crisp tender, lower heat if needed. Season with salt & pepper. In a small bowl, combine olive vinaigrette base with an equal amount of olive oil. Whisk to combine. Open one of the trout packets to check for doneness (careful not to let the steam burn your hand). To serve, simply transfer to plate, cut a slit in the top with scissors, and let your family rip them open and dig in. Serve green bean & cauliflower sauté on the side, finishing the veggies with a drizzle of the olive vinaigrette. This entry was posted in Meal-Kit Recipes, Seafood on January 17, 2016 by Megan Rappe.